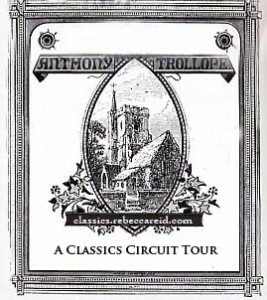 The Classics Circuit’s Anthony Trollope tour is in full swing. It began Monday, December 6 and will end Friday, December 17. The button comes from the frontspiece of the first publication of The Last Chronicle of Barset (published 1867). Anthony Trollope was born in London in 1815. When he died in 1882, he’d written 70 major works, including novels, stories, sketches, essays, and travelogues. Here’s my review of Barchester Towers, followed by some more comments on the tour. I’d never read Trollope before, and chose to read Barchester Towers for this blog tour. First, because it was a familiar title. It’s part of The Chronicles of Barsetshire, one of Trollope’s best-known series. And second, because I had a copy on my shelves that has gathered dust for something like 20 years. I thought it was high time I read it! And … I made it through 140 pages of this 533-page tome before throwing in the towel. But the humor was not enough to compensate for the glacial pace. In 140 pages a new bishop was appointed, and the bishop and his wife had a party. In between these epic events, various characters were introduced. Trollope spent 11 pages describing five members of a notable family in exhaustive detail. The bishop’s party received similar treatment, except that took twice as long. I just lost patience with it. At first I was disappointed in myself for giving up, for not appreciating the detail and use of language. Then I thought about Charles Dickens, a contemporary of Trollope. I don’t particularly like reading Dickens either, but I adored dramatizations like Bleak House (2005), and Little Dorrit (2008). These films brought Dickens’ world to life in a way the books never did. As I was struggling with Trollope, a bookish friend recommended the 1982 BBC production of Barchester Chronicles. If nothing else, I think I’ve learned that the best way for me to experience Victorian literature is through film. I couldn’t agree more. One of the characters in Barchester Towers dabbled in Judaism (as if that even makes sense), giving Trollope a forum for overt racist comments about Jews as “dirty” people. It was unbelievably offensive, and even though I know it’s unfair to hold Trollope to today’s standards it was a complete turn-off. But who knows, maybe I’m alone in my views on this book. I’m looking forward to visiting these blogs for more thoughts on Barchester Towers, and I hope you’ll join me! To learn more about Trollope’s entire body of work, check out all the tour stops. This entry was posted in classics circuit, reviews and tagged classic. Bookmark the permalink. I read this with great interest, Laura, because I am a little more than half way through my Trollope novel (although mine is less than 300 pages…so I think I can probably get through it!). I am also am finding that his humor is quite funny (especially when it comes to the interactions between men and women as in the example you gave!). BUT, that said, I agree, the descriptive passages are long and exhaustive (I think that is typical of Victorian literature in general, but I never enjoy it). Sometimes I want to scream at him: “Enough! Get to the point!” So I’m not loving Trollope, but I think the book I chose is a little more “doable” and there are parts I’m enjoying. I don’t think I could get through over 500 pages of it though!! I did enjoy Trollope’s humor, Wendy. I eagerly await your review! LOL!!! That is so true. I’m sorry you didn’t enjoy this book, Laura. I loved it, but I can definitely understand the problems you had with it. Trollope’s writing is very descriptive and slow-paced, which won’t appeal to everyone, and I agree that some of his comments are offensive. I love the characters he creates, though, and the moral questions his books raise. Helen, I thought the premise, and the extreme poking fun at clergy, had great potential. Ah, well, so it goes! I’m about halfway through with it now and I’m really enjoying it. I’m sorry you don’t like it! However, I can recommend The Way We Live Now — it’s really long but the miniseries adaptation is also great. I’m glad you’re enjoying it, Karen! I really was quite surprised that I didn’t. I loved this book, but started with ‘The Warden’ and think I might have struggled a bit more if I hadn’t read that first. The advantage of ‘The Warden’ is that it’s reasonably short which made it easy to finish, and by the time I’d finished it I was hooked by Trollope. I know the passage you mean in Barchester Towers regarding attitudes to jewishness – it certainly catches the eye, and certainly reflects Trollope’s (and his times) prejudice but it clearly wasn’t meant to offend – I found it a useful reminder of how ingrained and respectable that sort of casual racism once was, something I don’t think we should forget or be put off by! There is also a deep prejudice against catholics (again common for the times) low church evangelists, and some pretty obnoxious ideas about women none of which detracts from my pleasure in reading him… but after that long hobby horse style rant I didn’t have the patience for Trollope 5 years ago and I also have a fascination with these sort of prejudices now and trying to understand how people thought – could be reasonably enlightened on one hand and so horribly bigoted on the other. I like the idea of approaching Trollope with an aim of understanding the people of that era. I think I was just in the mood for a funny leisure read and it wasn’t that, for me. The more I read of other’s reviews of Trollope, the happier I am that I chose to read The Warden for The Classics Circuit. At 284 pages, I was happy to see it wrap up. I’m not sure I would have lasted for a full 533 pages, and I didn’t encounter any of the racist remarks that others have mentioned. I had planned on reading Barchester Towers next, but it may have to wait for another challenge. Thanks for your review–it was still fun to read even if you didn’t finish the book! Jane, I think I might have fared better had I tried a shorter book. Good move on your part! Enjoyed your review and I can defintely see your point on the slow-moving nature of the book. Barchester Towers should be my next Trollope, having read the Warden, but I suspect it will be a while before I get to it! Hi Falaise, thanks for stopping by! I would love to hear your take on BT should you ever read it. I was looking forward to the Barchester books (I’m reading the Pallisers right now) and I’m sorry to hear that the attitudes are a bit annoying. Hate it when that happens. Rebecca, I may try Trollope again someday. I have this nagging feeling that I should have enjoyed this more. I agree the character development is outstanding. It may have just been the wrong book for me at the time. And despite that, I still enjoyed the tour!